As in the case of plain oil circuit breaker described earlier, the quantity of oil required reaches very high figures with the increase in system voltage. This large quantity of oil increases the size of breaker and maintenance problems. We know that the oil in circuit breaker performs two functions. Firstly, it acts as an arc extinguishing medium secondly it insulates the live parts from the earthed tank. Actually, the quantity of oil required for arc extinction is very small and major part of the oil is used for insulation purposes. On the basis of this fact, low or minimum oil circuit breaker has been developed. It is also known as minimum oil circuit breaker or live tank circuit breaker. In a minimum oil circuit breaker very small quantity of insulating oil is used in arc extinguishing chamber. For insulation purposes, different insulating materials like porcelain, bakelised paper, glass-fiber etc. are used. 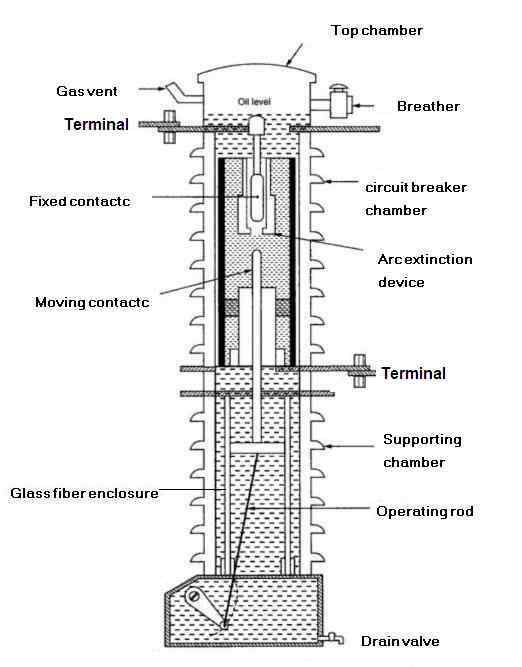 The construction of a low oil circuit breaker is shown in the figure. It is made up of two oil-filled chambers, which are known as upper chamber and lower chamber and are separated from each other. The arc is extinguished in the upper chamber, therefore, it is also known as arcing chamber. This arcing chamber consists of an arc control device, an upper fixed contact, and a lower moving contact. The whole assembly of arc control device, upper contact, lower contact is immersed in oil and enclosed in a glass fiber enclosure. The oil of the lower chamber is used for insulation purposes it does not get engaged in the arc extinguishing process. Both upper and lower chambers are individually surrounded by cylindrical shaped synthetic resin bonded paper within a porcelain insulator. An operating rod is permanently connected to the moving contact and operating mechanism. It moves vertically in order to make and break the circuit. When a fault occurs, the moving contact and fixed contact are get separated as current is flowing through the circuit, an arc is struck between them. The oil in arcing chamber attains a high temperature and vaporizes. The gases (mostly Hydrogen) are generated due to vaporization of oil. Due to the cooling effect of hydrogen arc cools down and its pressure splits it into small arcs. As oil between the contacts gets vaporized in this process some fresh oil is filled between the contacts. This fresh oil also gets vaporized and generates gases and again fresh oil is filled. This cycle continues until the arc is extinguished near current zero instant. The arcing chamber contains a separator which fills fresh oil in it, by centrifugal action, when breaker operates under a fault condition. An oil filling valve is also fitted in the top casting of the arc-control device. This valve, lightly spring-loaded, closes when the pressure is set up within the device, but as the pressure vanishes due to arc extinction, the valve opens to allow the inrush of oil. Due to the oil filling valve, vaporized oil is quickly replaced by fresh oil when the arc is extinguished. A spring-loaded vent valve, a breather to prevent moisture from entering the circuit breaker is made in the upper arcing chamber. To protect circuit breaker from damage if excessive pressure arises in arcing chamber, a safety diaphragm under the domed cover is designed to lift. The low oil circuit breakers have smaller tank size, require a lesser quantity of oil, smaller weight, lower cost, reduced risk of fire and reduced maintenance problems than bulk oil circuit breakers. But rapid deterioration of dielectric strength of oil due to a high degree of carbonization is the main drawback of these circuit breakers. once in 6 years to 7 years. © https://yourelectricalguide.com/ low | minimum oil circuit breaker principle.